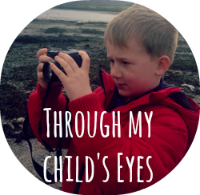 Hello and welcome back to through my child's eyes, the link up for children's artwork and photos. A big big thank you to the four bloggers who linked up last week, there were two wonderful drawings and two amazing photos. I loved the drawings from Harley over at Mylifemylove.com featuring some impressive round knee caps. Also there was a lovely hand painting from W posted on Workingmummyandwife.com. I loved the idea of creating animals from your hand prints, it makes a wonderful painting. I also want to give a shout out to Little Ladybug for posting her gorgeous photos from her visit to the farm, she is an amazing mini photographer. Lastly, thank you to Merlinda over at Glimmer of Hope for posting her mini photographer's photos that he took when he visited a helicopter museum. You can really tell that he loves taking pictures. I showed my children each link up and they were very inspired by the artwork so this week they wanted to submit their Easter themed drawings to my blog. The top two pictures are by my youngest and feature the easter bunny handing out eggs. The bottom picture is by my oldest son, Alfie and is also the Easter bunny. I'm not too sure what the orange thing is though. It's either a basket or a crab, any ideas? I asked Alfie but he isn't sure either, he just said he felt like drawing it.